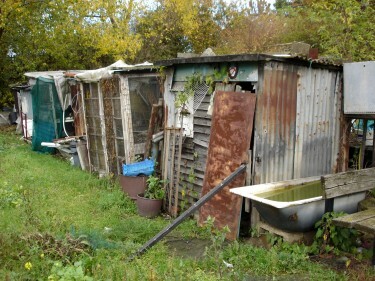 My friend David has an allotment in a forgotten triangle of the London A-Z. It’s in the East End, a stone’s throw from the North Circular. As we stand under the electricity pylon in the din of traffic roaring across the flyover, the pollution is almost palpable. Another problem is that plots are regularly robbed and vandalised, sheds going up in smoke and runner beans ravaged. But there’s a plus side: no-one has paid any rent for years. The site seems to have disappeared off the council’s radar. So tenancy agreements are, shall we say, informal: if you let the grass grow under your wellies, your neighbour offers your plot to a passerby (how David got his). I can’t help picturing a diamond geezer leaning over the fence and winking. Despite this threat, as on allotments everywhere there are different degrees of commitment. One couple have installed a wood burning stove in their corrugated iron shack and practically live there in summer, cooking veg as they go along. At the other end of the scale, one bloke does the bare minimum, visiting once a year to torch his weeds and get blind drunk in his shed. Even though this last option was one my Dad talked of fondly in the early days of our allotment tenancy oop North, the general contrast between the London set up and ours in t’middle of t’countryside couldn’t be more marked. For a start, our allotments are spacious, quiet as owt and seen from the air via Google, actually look LESS verdant than their surroundings. It’s the other way round in the East End, where the lozenge of green has to breathe in to squeeze between grey-roofed terraced houses to the west, grey dual carriageway to the east and grey railway lines to the south. In our small town, where we have only to raise our eyes to see open moor on one side of the valley and wooded hills on the other, demand for allotments is five times higher than in London. The waiting list for our site is 180-strong and growing. New applicants are told they won’t get an allotment ‘within their lifetime’. An odd turn of phrase, since the dead are hardly known for their gardening skills. And there’s no chance our parish council will ever forget us. Especially not if Dad goes on writing letters to them about the wych elm. Consequently, we’re ruled and regulated to within an inch of our gardening-gloved, rabbit-proof-fenced, rotavator-totin’ little lives. Heartening then that despite these differences, both allotments are home to the same sort of people. People who beam at the sight of a tightly packed spring cabbage and like to build cloches out of pairs of chair legs rescued from a skip. People who will stand in drizzle explaining how to cut flaps out of a lemonade bottle and hang it on a stick so it revolves in the breeze. People who build polytunnels from market stall scaffolding and sheds entirely from doors (as David says, it’s hard to work out which one you open to get in). I can’t wait to plant them. I haven’t many seeds to give back yet, but there’s something magic about the exchange. What will come up, from London seeds in Yorkshire loam? Pearly kings and queens, perhaps, springing up under the blackcurrant bushes. Beans with flowers that chime like the Bow Bells. A walking stick for Dad, with a handle shaped like the head of Phil Mitchell from Eastenders. And down there on David’s plot, there’ll be flat cap mushrooms, taciturn turnips and curly kale that keeps ferrets up its trouser legs. Photos 1, 2 and 3 by D. Martin. Very entertaining as usual, although I note the complete disappearance of Mr MS. 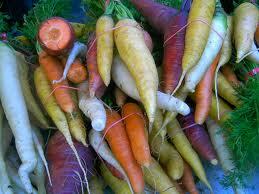 I love the colourful carrots. I’d eat them. Yes, Mr MS appears to have gone to ground. Something to do with the falling temperatures, I suspect. Amazing carrots. Measured and mindful account of the very, very good indeed life. this is such a wonderful antidote to the constant tension of Palestine. I’m really glad to have this as light relief. Love the carrots! Down its trouser-legs, absolutely not up! String round the ankles, he quibbled. Very contemplative and different. 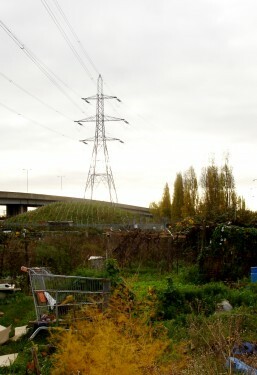 Very “London Orbital” – Iain Sinclair. The black-and-green economy. Root vegetables and deep flavours. Love it. Loved the accent in particular. But actually I’m not sure I’m right now. You’ve got me all wobbly and distrusting my recollections of tales (tails?) from the deepest Pennines. Hold the line…. gives all the detail you’re likely to want, ever. John, Mr MS asks, are you a secret ferret legger? No, just a theoretician in pennine folklore. But I value my personal heritage too much, to attempt the practicals. But enough of this. I don’t want to change the subject…. Looking forward to your next autumn-coloured episode. Your post gave me the idea of the pleasure of viewing one’s allotment from Google Earth- the tattiness/fecundity of ours is plain to see and there’s no distinguishing the flowers from the weeds at that distance which is a great relief. I think I’m with your dad about the colour of carrots and have already decided to be a purist about swiss chard. I stick to the green and cream since I discovered a very unhorticultural friend of mine making a strangely (at least to her) tasteless rhubarb crumble out of the red variety. I do like that compost heap. Any advice on raised beds? I need some for the little patch behind the hornbeam. Mr. G M has been promising some from the stacks of wood kept in his shed but two years have gone by since this was first mentioned. Yes, careful, John. I’d stick to stoats if I were you. Janis, did you get any sense of when the picture was taken? 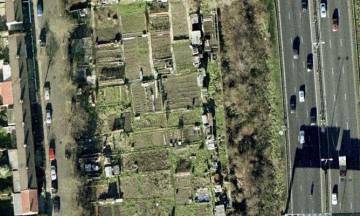 When I looked up our allotments, the precise bit with our plot in was still only wasteland with trees. Interesting because as soon as it was developed, no-one (including us) could remember what was there before. Gail, that’s a cracker about the 2-yr-old stacks of wood! Could you make the raised beds yourself? I’ve watched demos on YouTube and it doesn’t look that hard. A power screwdriver and you’re away! I hear it’s best not to use preservative, but go for wood that won’t rot, like cedar. In another lifetime I had an allotment in NE London but was shamed into giving it up after complaints from fellow allotmenters – the phrase “uncultivated and weedy” has stayed with me ever since…..
Could there be a competition to see where the biggest turnips, for example, are produced? Pete, as far as turnips go it’s ‘never again’ for me (we’re not even halfway through them yet) but a competition to produce the highest walking stick cabbage would be a different matter. Perhaps this is the start of a Lonely Planets Guide to Allotments of the United Kingdom. I’d buy it. thanks Mandy for fixing my errors and putting how dare he, who leers where it belongs. cultivated AND weedy.